I wonder how long I could stay at home without going a little dotty. The first year I was in Oregon, teaching at Lake Creek School at the tender age of 19, I had something going on every single evening of the month of December. Programs and practices and youth activities and out to dinner with my cool friends and family gatherings with my landlord's family and church and many other wild and happy activities! I was out of Minnesota and off the farm, and I had a life!! At last!! Some years later, we have the last few weeks of January, 2018, in which Paul and I drove an hour and a half one Sunday morning to go to Dema Chupp's funeral, then that afternoon we went to a fancy AirBnB house for a retreat with the church ministry team for a couple of days. We had exactly one day at home before we flew to Pennsylvania for a school administrators' conference. The following weekend I was gone again, to the church ladies' retreat at the coast. "Do you like doing this sort of thing, or would you rather stay home?" Emily asked me before we went to Pennsylvania. I said, "To be honest, I'm already thinking, 'Only one more week and I'll be home again, making tea in my own kitchen!'" Paul said, to Emily, "I think she goes away just for the thrill of looking forward to coming home." Since the ladies' retreat, I have stayed home a lot. I make tea in my kitchen, with the best water in the world in my own sturdy kettle. Every time a planned activity gets canceled, I do a happy little Mennonite-lady dance. Every day when there's nothing scheduled away from home, I feel blessed and grateful. 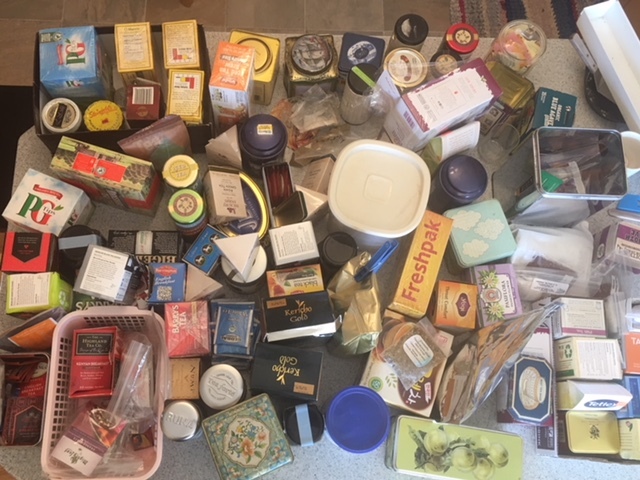 One day I gathered every smidgen of tea from two pantries, one cupboard, the gift drawer, and the countertop, and I sorted and evaluated it all. Then only one of each type went into the kitchen cupboard, and the rest went into the pantry, sorted by type. I've found that you can read all about downsizing and efficiency, but the key ingredient that is often missing for me is staying at home to do it. When you're gone a lot, you lose track of where you put the box of mint tea, and you're all rushed, so you buy more. Also, the white jasmine tea that no one likes migrates to the back of the top shelf, where no one sees it, and sits there taking up space for years. So while it was alarming to see how much tea I actually own, it was utterly satisfying to get it all in proper order, and to get rid of what no one uses. "Don't judge," as worldly people like to say when they know they are being ridiculous. I've also been setting up my new sewing room upstairs, now that the old sewing room is a guest room. This has been a long process, starting with boxing up and storing my sewing stuff when Dad came last summer, and only recently picking through it again. My pattern stash is a lot like my tea stash, with some of the same unfortunate duplicating and also there's that whole boxful I got from my friend Sharon when she moved, which never got sorted and put away. So the patterns are to get categorized this week, after I get the box of mid-size children's patterns down from the attic, and I hope to send half of my collection to the MCC Relief Sale. Along with sorting and organizing, I've been sewing. I finished an apron I started long ago, altered two blouses to make them fit, made a skirt from start to finish, and also made a little girl's dress just because I was in the mood to make a little dress. No wonder my mom always looked so blissful and content, staying home and sewing while the snow fell. But was I going just a little crazy? I watched for signs. Was I living vicariously through my daughters' adventures out in the big world? Well, I always do that, so that doesn't count. Was I arguing with people in my head? Not excessively. I kept sewing and organizing and also staying caught up with our laundry, which is a wonderful thing. I made tea several times a day and read two books. I canned sausage like I was preparing for a siege. One day I took offense at something Paul said, and over-reacted just a teeny bit. But we talked about it almost right away, and I didn't spend a week arguing with him in my head before I brought it up, so that was all ok in the end and not too alarming. That was when I knew that staying home this much was good for me, and healing and healthy and life-giving. Because when things are far too busy and we are running, traveling, going, meeting, driving, flying, and just zipping hither and thither, then church becomes a heavy obligation, another thing on my endless list, and a duty to be dutifully performed. I'm always glad I went, but getting out the door on Sunday mornings--that's the hard part. *Yes, I also go to church to worship God, in case you're worried. But I was also happy about talking to his people. We don't have much on the calendar for this coming week, either. 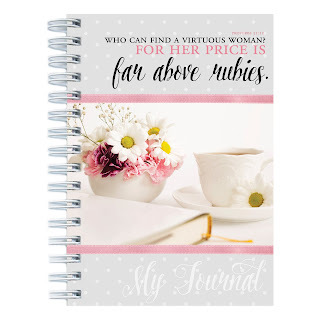 I am starting to ask God who I'm supposed to call, write to, invite over, or meet for coffee. Certain people are coming to mind, women who aren't visibly needy, but they show up in my thoughts with a quiet nudge. Yes, her. She needs someone to talk to. Because that is also a benefit of staying home: you feel like you have something to give to others, room in your soul for another, space in your mind for listening--instead of cringing when the phone rings or feeling overwhelmed at another email to answer. There's a bestselling book called The Lifechanging Magic of Tidying Up. If I wrote my own version, I would call it The Lifechanging Magic of Staying Home. But first I'll go have some more tea. Jenny: Dad should learn to play the didgeridoo. It helps with snoring. Matt: Jenny, be VERY. CAREFUL. what you wish for. Some time ago I was asked to give a talk to a local business group about how they can meet the needs of the Mennonite community. I said that Mennonites generally value self-sufficiency and thrift. So any business that will help us do things for ourselves, for a reasonable price, will be our friend. For instance, Detering Orchards or Horse Creek Farms and their you-pick fruits, or Territorial Seed and its amazing garden seeds, or Hurds Hardware and its custom metal fabricating that will build exactly the attachment for the forklift that Paul needs to do his job at the warehouse more efficiently. Almost every Mennonite or Amish community of any size has a little store that sells bulk foods, fabric, cookbooks, and canning supplies. 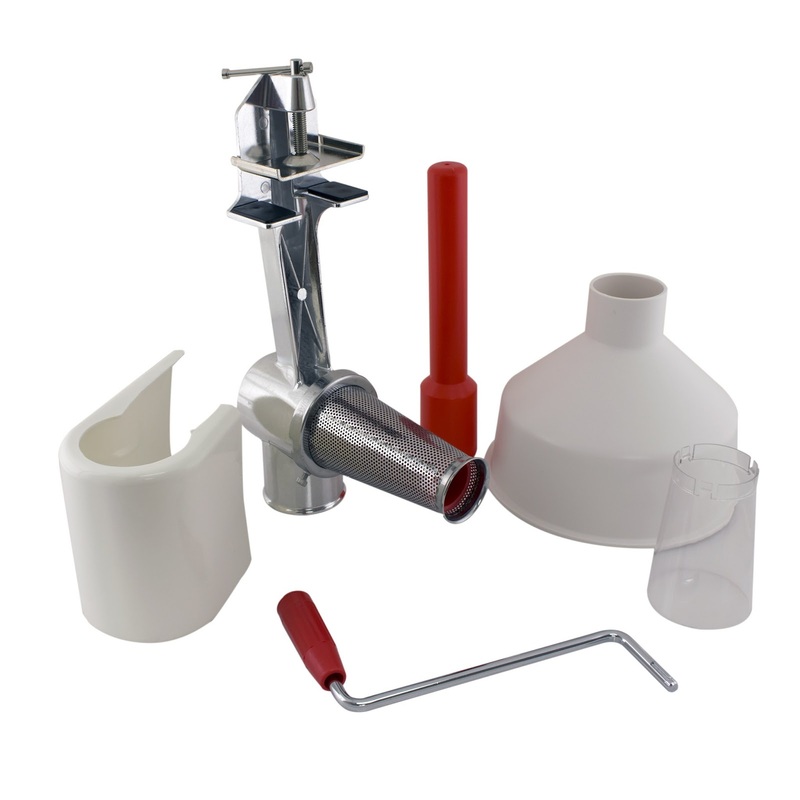 Almost always, they are carefully chosen items, of good quality, for a reasonable price. Self-sufficiency and thrift, you know. 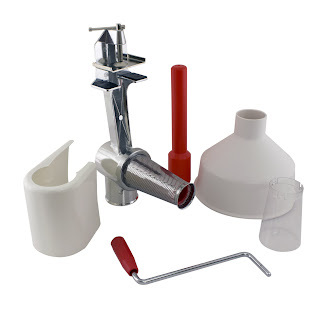 I love to shop at such places because you don’t have to dig through aisles of nonsensical throwaway gimmicky stuff to find what you really need, nor do you have to worry that this can opener will break after a week. These places distill their inventory down to the basics, but they also have half an aisle of pretty candles and teapots that you can give your sister-in-law for her birthday. You would like to shop at such a store, I'm sure. If you live in or have visited Pennsylvania, you probably know all about Goods, which is a large version of the little Amish and Mennonite stores found further west. If you don’t or haven’t, you can now shop at Goods online. Right here. 1. The site is pretty without being cheesy. I appreciate that they don’t co-opt the Amish name in order to sell products, although you'll find a Pennsylvania Dutch cultural flavor throughout, such as the brass quoits set from Fisher's Harness Shop. 2. I liked the subdivisions of merchandise on the main page. Lawn&Garden, Health&Beauty, etc. And my favorite: Fabric&Sewing. 3. My one complaint about the website was at this point. You can find subdivisions by brand name, such as Dritz, Moda, or Schmetz; but you can’t click on product categories like fabric, thread, and scissors. So your options are to do a search at the top of the page or to click through all the products and hope you eventually get past the fabric swatches and on to sewing supplies. 4. Clicking through the fabric products is a treat because they have many colors and prints and solids, especially the Tropical Breeze brand. I don't know how the price compares to other sources, but they also carry Moda quilting fabrics which are about 30% cheaper than at Oregon’s Fabric Depot. I managed to click my way through this section without buying anything which took great resolve. 5. 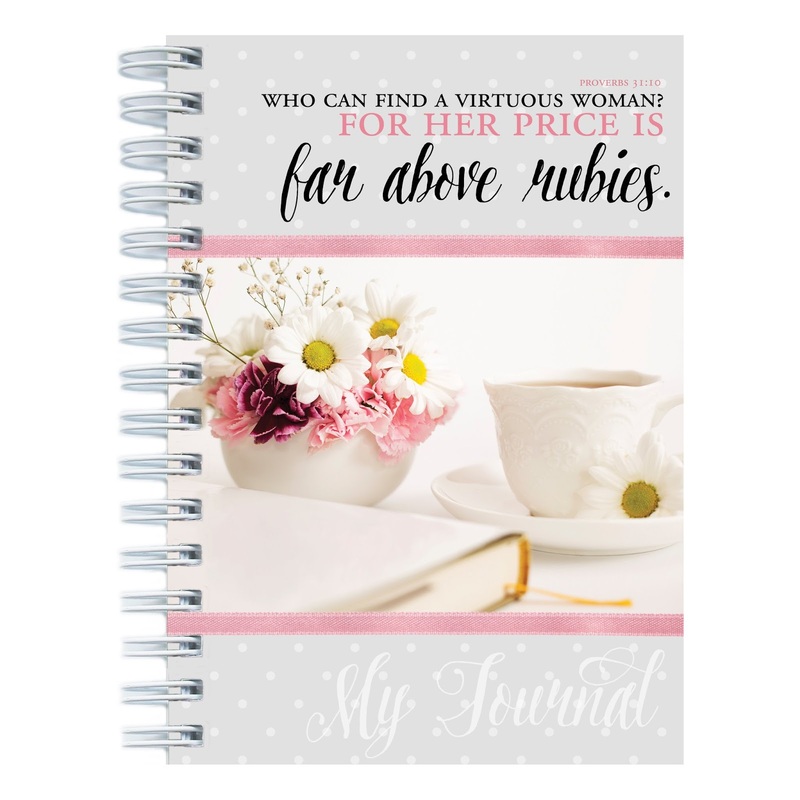 Some other things that caught my eye on the website were the outdoor thermometers, pretty journals, canningsupplies, and women’s clothing. 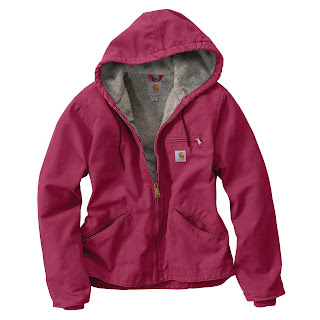 They even carry Carhartt jackets for women! At most retailers, women’s clothing is far less durable than men’s. Carhartt is a happy exception. But I didn’t buy the jacket because I bought a Carhartt hooded sweatshirt a couple of years ago, and it’s still my go-to cool-and-windy-day jacket. I decided to use my voucher to pay for part of a new Victorio strainer. Mine has turned out many a quart of applesauce and tomato juice and is nearly worn out. I expect the new one to be of high enough quality to hand down to my daughters when I’m no longer canning. If you use the following link, you can get a 10% discount off regular prices. This offer is good until March 17. Or you can use the coupon code DORCASBLOG when you check out. "She also liked small, local shops, places where you were able to buy pins and candles and tins of syrup--the sort of real things that you needed, rather than the insubstantial clothes and flashy electrical goods that newer, louder shops sold." --Alexander McCall Smith, describing Precious Ramotswe, in The Minor Adjustment Beauty Salon, number 15 in the #1 Ladies Detective Agency series. The pig was 12 cents a pound, live weight. My delight with this bargain was tempered by a pang of sympathy for the hog farmer, whoever he or she might be. You think of such things when you once drove a load of pigs to the sale barn at age 16 in an old pickup truck that liked to stall at intersections. Our family finances, sketchy at the best of times, descended deeper into debt and despair when the price of hogs dropped. I’ve learned since then that poverty is far more complicated than dollars and wages and prices. It also encompasses invisible and immeasurable metrics of support and skills, opportunity and relationships, and values and traditions. My husband’s sister Lois and her husband, Ken, are remarkably self-sufficient, even for Mennonites, in every domestic art from gardening to rug-making to keeping livestock to home repairs. Ken reminded us that he could help us butcher a pig if we needed pork, and when he found a 600-pound hog for that impossibly low price of 12 cents a pound, we agreed it was time. The hardest part of the process, says Paul, was cranking the old sausage stuffer that used to belong to Grandpa Orval. Paul turned the handle and Ken carefully controlled the casings so they were full but not bursting. After that, Ken smoked the meat for three hours in his brother David's smoker. Meanwhile, I dug in the pantry for all my empty quart canning jars, Kerrs and Balls and Masons, many of them older than I am. I also pulled my pressure canner off the shelf and borrowed another canner from Lois and two more from Simone, the cousin’s wife just down the road. Paul stomped heavily into the kitchen and placed an enormous blue plastic tote of sausage on the table, then a red one a few minutes later — 150 pounds of meat in all. The long cold sausages looked and acted alarmingly like large snakes, coiling heavily in the totes and then flopping in muscular curves and curls when I lifted them out, one by one. In the Smucker family tradition, there is one and only one way to can sausage. You cut it into 2½-inch pieces. Then you put seven of these, upright, into the bottom of the jar, like stout spools of thread standing side by side. Seven more stand upright on top of these, and two more lie down on the very top. That is how it’s done. There must be a faster way. I picked up a long rope and carefully threaded it head first into a jar, then coiled it around and around and snipped it off when it reached the top. I shoved another piece down the empty space in the center and snipped that off as well, and the jar was full. I weighed my jars. Two pounds of meat in each. Yes! Quickly, I filled one jar after another, coiling and pushing. They looked just as horrifyingly snake-like inside the jars as out, but I wanted the job done fast. He actually called Lois, just to make sure. I felt like those spunky and courageous girls in “Amish” novels, breaking family tradition like this. After they’re filled, the jars must be pressure-canned at 10 pounds of pressure for an hour and a half. Every good farm wife has an extra stove just for canning, especially if the kitchen stove has a flat surface. My canning stove came from my friend Gina years ago, for $20. It’s stained and old, but it works perfectly. Watching two or three pressure canners at once takes even more courage than breaking a family tradition. I flitted nervously back and forth, monitoring gauges and timers and burners, knowing that if one of the canners exploded, it would take half the house and me with it. And what would Grandma Lena say if I showed up in heaven as a result of canning sausages a new and very wrong way? When I had used up all the non-mayonnaise jars in the pantry, I poked around in the east half of the chicken shed for the box of jars I inherited from my mom’s stash. In typical ingenuity, she had zig-zagged a long strap of old fabric and duct-taped it cleverly under and around the heavy box to form two handles. My daughter Amy washed out the spiderwebs and dust and sanitized the jars in the dishwasher. Emily filled them with the last of the sausage. Seven quarts per canner, 90 minutes each, batch after batch. Rows of sealed jars, plump and proud on the counter. Another generation learning by doing. This is also how it’s done. I have been reading about poverty — from news articles on fees and fines that impede progress for low-income people, to Barbara Ehrenreich’s condescending but informative book “Nickel and Dimed.” I’m learning about the descending spiral of poverty and the difficulty of climbing up and out. When we had four small children, I stayed at home and Paul worked a barely minimum wage job. We slowly worked our way out of that frustrating lifestyle to a pleasant place where we can now buy new shoes if we want to, and a car breakdown doesn’t derail us financially. This transition was possible because we always have had access to that mysterious source of wealth that is never tallied on government reports or factored in economic projections — the resources of a caring family and community, skills and equipment and thrift passed from one generation to another, and a willingness to help others for no compensation besides eventually being helped in return. The price of commodities is out of my control, and there is little I can do about vast inequities and financial policies. We donate money to charities that offer help to the poor, and I loan my pressure canner to others who need it. But maybe my husband and I need to find new ways to draw people into our circle of family and community, trading their skills with ours, sharing what we have, teaching what we’ve learned, and learning from them. True, we put hours of hard work into this project, but it was mostly because of a generous circle of people who offered, taught, loaned and helped that we were able to gather 65 quarts of the best sausage in the world for less than $50. We are abundantly blessed and breathtakingly wealthy. "I drive by there, and I just picture you in your little cabin, writing away!" Several people have told me that, recently. So today when I worked in my Sparrow Nest I thought about what I actually do when I "write," since I do a lot more than just type and create. 1. Deleted about 100 emails and slid the publishing-related emails over to the Muddy Creek Press folder. 2. Called one woman to tell her I can't speak to her group in May, but my schedule is open this summer or fall. 3. Made a list of all the books and websites that I promised to review, so I don't forget, being prone to overpromising and underdelivering. 4. Texted another woman to say I could speak to her group's Mother-Daughter tea. 5. Inventoried my books. This was actually done in the non-coop side of the chicken shed and is one of my least liked activities, but it must be done for tax purposes. 6. Gathered a few notes for my upcoming talks in Montana, and put them in a folder. 7. Updated my calendar with the above speaking events, hoping sincerely that I didn't forget any, being prone to nightmares about not showing up when I've promised to be there. 9. Re-read my newspaper column for February to see if I missed anything that someone could possibly get offended at, before it's printed on Sunday. Why do I do this? I NEVER predict what will offend people and am always blindsided. 10. Admired the pretty dry-erase markers that Steven gave me for Christmas and chose the teal-and-berry one to write on the board that I'm so proud of--one of my mom's old metal work-table toppers, covered in dry-erase contact paper. Sometimes I do all the above stuff when I ought to type and create, but am putting it off. We have too many cats. At least two strays came by and had babies under our porch. Of course it's hard to know that this has taken place until the kittens are big enough to go exploring. And by that time they're completely wild. But not too wild to come eat the food we put out for the family cats. People will often take kittens if they're tame and cuddly, so it seemed logical to bring a few inside and calm them down. Even a shelter is unlikely to take them if they're terrified and a bit crazy. So about a week ago, I poured food in the dish and then stuck my arm out and grabbed one and put it in the back of the house where there's a tile floor and you can shut all the doors. I did this a second time, except that kitty went completely crazy, scratching wildly at my hand and then disappearing in a blur. It squeezed in behind my desk and crouched there. I read online that a bit of Benedryl will calm down a frightened cat, so I mixed Benedryl with cat food and offered it. Hours later, it was still pop-eyed with terror and hadn't eaten the food. Well. Epic fail, as the young people say. I might as well put it back outside. So I got a broom and gently moved toward the kitty. It went insane, leaping up and streaking toward the kitchen, scratching and scrambling. Honestly, it would have been easier to herd a squirrel. A couple of hours later, the girls and I heard a faint meow. It sounded like it came from a kitchen cupboard. Carefully, we opened cupboards and looked inside, moving dish drainers and cereal boxes. No cat. The meowing repeated, muffled but real. We were totally mystified. We took the front panels off the bottom of the dishwasher and refrigerator. No kitty. But the meowing still sounded from underneath, somewhere. "It has to be in that space under the cupboards!" Emily said. Paul said, "That's impossible. There's no way a cat can get in there!" We said, "But it IS." It was the weirdest thing, because Paul couldn't hear a thing and for all he knew we were just messing with his mind. We poked and hunted and shone flashlights, completely flummoxed. The meowing repeated, RIGHT in THERE. Could Paul come saw a hole in the bottom of the cupboard? Or could he get Kevin Baker, who built the cupboards, to come and pry it apart? Paul said he'd call Kevin in the morning. We pulled out the stove. Back behind it, down near the floor, were several small openings where you could get a glimpse of the old 2x4's and wainscoting from a hundred years ago. What if the cat had slipped in there and back in the dark hidden corners of the kitchen cupboards? Or what if it was down under the floor somewhere? 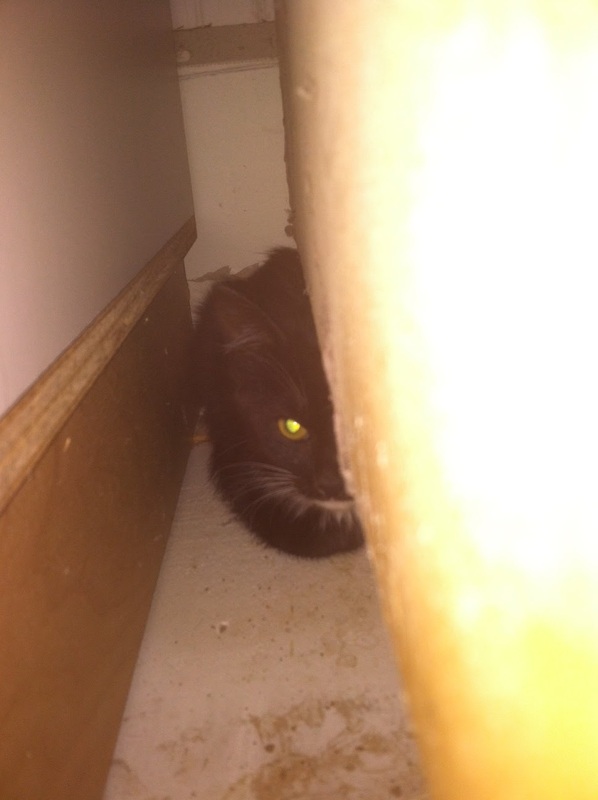 I have a horror of any living things trapped in dark spaces, so the thought of that cat down under the floor gave me chills. The muffled meows made me suspect that's where it was, and it would die there, and we'd have to tear up the floor like in The Telltale Heart. "Tear up the planks, I admit the deed..."
Paul, of course, said a cat couldn't possibly get down in the floor. Before going to bed, I left the stove pulled out from the wall and put a HavAHart trap with food and water in the middle of the kitchen. I didn't sleep well, hoping all night for the clang of the trap. Early the next morning I crept into the kitchen through one door just as Jenny came in the other. And we saw the kitty! Not in the trap, but close to it. And then just that quickly it was gone again. I thought it had slipped back through a hole behind the stove, but Jenny was sure it had been over by the sink. She got down on the floor and felt around, then turned to me with big round eyes. "There's a hole!" "WHERE?" We had looked on every possible inch, hadn't we? "It's down here, but it goes UP!" I felt around. You know how all good cupboards are set in about 4 inches at the bottom, to make a space for your feet? In the little ceiling of that indentation was a hole less than three inches square. I stuck my fingers in and wiggled them, and something hissed. Jenny and I looked at each other. Yesss!! But how and what and where did that hole lead to? "We need to take a picture!" she said, and tried to stick her phone in, but it was too big. I found my old iPhone and Jenny poked it up and in, and snapped a picture. There it was, in that narrow space between two sections of cupboards. What a relief that it wasn't trapped down below. And leave it to a cat to find such an impossible hiding place. When everyone was off to work and school, I opened the door to the porch and dumped the food in the cats' dish with as much noise as I could. Then I left the door open and walked away. Just as I hoped, the kitty made its way outside to join his friends. I am done trying to tame cats. However. Sometimes I meet someone or hear someone speak and I just sense things about them, real and vivid things, but I can't for the life of me explain or quantify how I see and know what I do. Recently I heard a speaker who gave me a creepy vibe and I just "knew" he was a wolf in sheep's clothing and took advantage of innocent people. Paul is always in a bad situation when I go off about these feelings I have, because he doesn't want to squelch my intuition but the truth is he doesn't see or feel or sense or pick up or suspect ANY of this, not one smidgen. So he was carefully choosing his words and suddenly I had an epiphany. "This is what it's like!" I crowed. "It's like I hear that kitty meowing and I know it's under the cupboards somewhere and you can't hear a thing!" Paul said actually, we were both right and wrong about the kitty, because it was neither under the floor nor under the cereal cupboard, which he had declared to be impossible, but it WAS back in there, in the general vicinity, so I was right about that. So maybe when I pick up on spiritual and invisible things about people and Paul does not, we are in some way both right and both wrong. But it doesn't solve the problem of having too many cats. Paul: [fixing curtain rod] Can you get me a screwdriver?